When you see the “Check Engine” light flickering on the dash, isn’t it frustrating when you have no idea what causes it? Isn’t it more annoying when you do not know what to do? Should you pull over? Should you go to a shop right away? 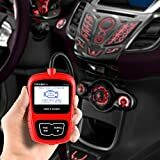 This is when you will need the help of a car code reader, which works to diagnose engine problems and therefore guide you if you should continue driving or not. Just plug it into the computer system of your car, and it will show the trouble code. 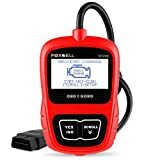 If you have a basic knowledge of car engines, owning a Foxwell CAN OBDII/EOBD Code Reader NT200 is valuable because it will give you a head start. 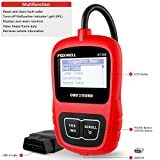 It will offer you quick access to trouble codes that will assist you in identifying specific engine problem and solution at an affordable price. Plug and play – This device is so easy to use. Make sure the engine is off before using. Plug the car code reader into the diagnostic connector, which you can find under the dash. Start your car and check the trouble code displayed on the screen. 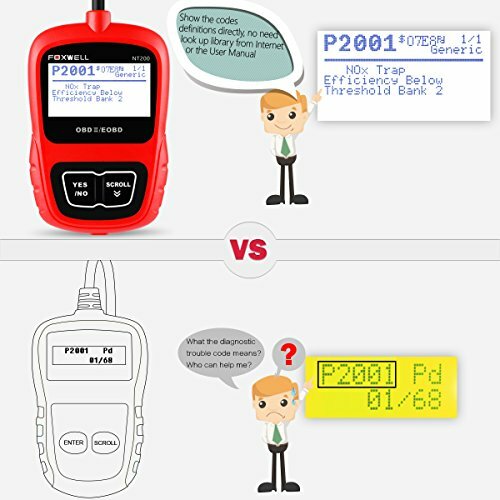 On-screen fault code definitions – You do not have to refer to the instruction manual to read the definitions for the error codes as you can read them on-screen. Support for multiple code requests – Compatible with generic, as well as manufacturer-specific and pending regulations. 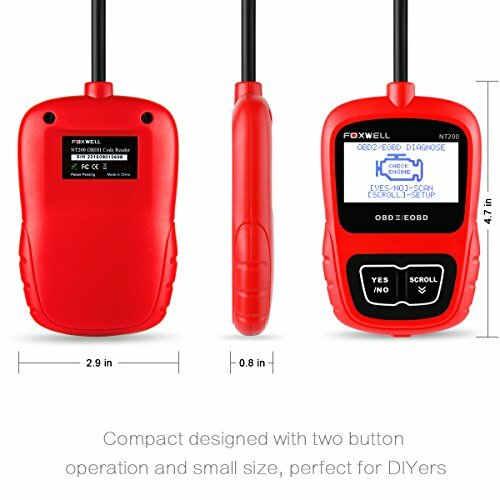 Multi-lingual support – The Foxwell CAN OBDII/EOBD Code Reader NT200 offers support for German, French, Spanish, English and other languages. 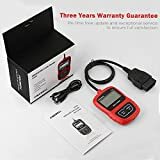 Warranty – In case you will have an issue with the car code reader, a one-year warranty protects you. Monitor and I/M Readiness status display – With this feature, you’ll be able to know the availability status – ready, not ready and N/A or N/S. OBDII/EOBD compatibility – This diagnostic tool works with OBDII and EOBD vehicles. 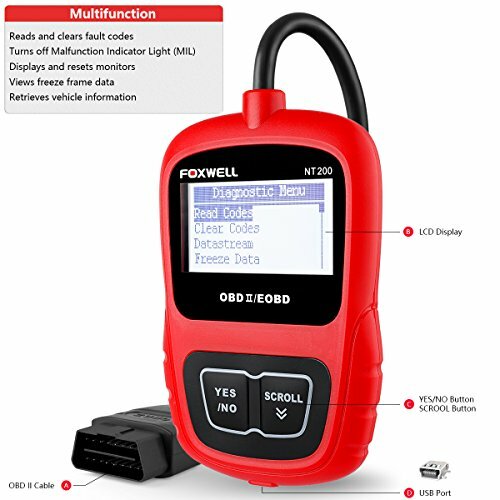 Real-time data streams – The Foxwell CAN OBDII/EOBD Code Reader NT200 offers live data streams to provide real-time information from the sensors of the engine. It requires no batteries. You can be sure that you can use it whenever you need it; no problem about your batteries being low or drained. There’s no such thing. The structure is well-built. You know you can use it for a longer span of time. The design is compact as well that you can hold it comfortably. Using your USB cable, you can perform software and DTC updates for free. Did you lose the copy of your CVN, CID and VIN? There’s no reason to worry because this car code reader helps in recovering vehicle information. The backlit LCD screen is big thus reading the information on the device is so easy. Because it offers one year warranty, you are protected for your purchase even for 12 months only. Code definitions are readily available. You do not have to research each time an unfamiliar code appears. It is easy to operate as you can already make it work in two ways: plug then play. Language will not be a barrier as it supports multiple languages, including Spanish, English, German, French and others. 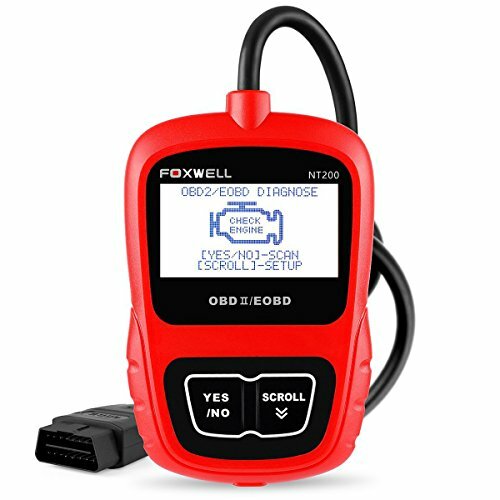 Foxwell CAN OBDII/EOBD Code Reader NT200 is the most affordable engine diagnostic device. 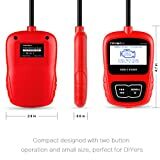 It is very efficient and offers fast troubleshooting when vehicle engine issues occur. 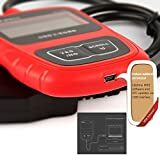 As for the downside, here’s the only one: It’s an engine diagnostic tool that tells you what causes your engine to malfunction. It gives you an idea of where to start: fix it on your own or call a technician or mechanic. So don’t expect too much as it can’t do everything.